Gibson has done it once again and made its Reissues even more enticing. Vintage vibe and heritage; fabulous tones and gorgeous looks. It's very expensive; we'd like to see an 'uber' limited edition with period-correct timbers; the slim 1960 neck is not for everyone. With the latest Les Paul Reissues boasting ever more vintage- accurate detail, Gibson has decided to change the name of the range to True Historic, to more accurately reflect what these guitars are all about. All True Historic models (in '58, '59 and '60 guise) are available aged, for a hefty £1,750 up-charge; the legendary Tom Murphy is responsible for their creation, and they come with an exclusive hardback booklet proclaiming so. Our 1960 model in Vintage Lemon Burst is one such rare beast. Hand-in-hand with the name change comes a raft of forensic detail upgrades. First, Gibson declares that both mahogany neck and maple cap are 'double carved'; the second carve is apparently to eliminate inconsistencies from 'slack belt' sanding and other processes. The tops are then hand-shaped to produce the final contour: catch the top right and the light picks up the dished perimeter beautifully, its highly figured yet subtle grain dancing like flames in a fire. Of the double-carved neck, Gibson says that each profile - from the fat '58 to the skinnier '60 style of our guitar - feels that much closer to its vintage forbear. Other changes include re-assessing the plastics and recreating them with microscopic accuracy. The pickguard is more faithfully reproduced, including the slightly ragged edges of the originals (contrary to popular belief those vintage gems weren't pure perfection), and larger countersinks for the screws. Around the back, too, the control cavity plate looks slimmer and the plastics more accurate in colour. The fitted die-cast 'True Vintage' toggle switch cover can be swapped for a supplied plastic one, should you prefer. The nickel-plated pickup covers, too, have been re-tooled, with production methods more akin to the late-50s. So, the corners and radius are more precisely shaped. Plus, as the originals' polepiece holes were punched from the rear, the tops were sanded to flatten out lumps and raggedness, hence imperfections here and there. Another important factor in making the guitars look, feel and play better is in the softening of certain areas that were previously left sharp. For instance, the headstock's edges and pointed wingtips have been lightly dressed to leave a more hand-finished look; the fingerboard binding, too, has been 'rolled' along its top edge for a more comfortable feel. The finish itself has been wet-sanded by hand to reduce its thickness and lend greater authenticity (it's around half as thick as on this reviewer's own '56 Goldtop Reissue). "All True Historic models (in '58, '59 and '60 guise) are available aged, for a hefty £1,750 up-charge." There's also a thinner headstock veneer, re-tooled control knobs, pickup surrounds and a return to scraped binding where the stain is removed with a blade prior to clear lacquering. This can leave a perceptible ridge, but a happy byproduct is that the binding edges are made slightly softer. Aniline dye is retained for the grain-filling and staining process, but this, too, has been given a darker, more authentic vintage hue. Pickups are Gibson's Custom Buckers. These are asymmetrically wound, with the slug coil in each getting around 300 extra turns of 42-gauge copper wire. At 8.5kohms resistance, the bridge humbucker is 0.5k hotter than its partner. As has been the norm for a while, Bumble Bee capacitors are employed, along with quality CTS pots. Our guitar comes in Vintage Lemon Burst nitro and has gone through the Tom Murphy ageing process We'd say it features medium wear for an instrument that purports to be 55 years old; it's been crafted to excruciatingly high levels of detail and would fox many a Les Paul buff. One striking feature is a short section between tailpiece and endpin, where the two-piece top is apparently de-laminating. The use of original-style hot hide glue is now standard on True Historic models and, since this is susceptible to heat and moisture, such eventualities, while not common, certainly did happen. It adds real authenticity to the overall effect, but might be a detail too far for some. A highlight of the Murphy process is the lacquer checking. Tom achieves this with nothing more than a naked Stanley blade, but has it down to such an art that its authenticity would be almost beyond question were the truth not known. The guitar's standard-width but relatively skinny 1960 neck profile is not for everyone. But whether you prefer the more 'allthings to all people' feel of the '59, or the clubbier '58 experience, there's no doubt it's a comfortable handful. Any fingerboard edge sharpness is gone, and with the action perfectly set, right out of the case, the True Historic is a breeze to play. As mentioned in the recent 'Dutchburst' review (also a 1960), there's a feeling of easier top-end playability since, by slimming the neck, Gibson also shaves a millimetre or two off the crook of the heel, giving the thumb a tad more access and therefore the fretting fingers a mite more freedom. Sonically, we have no qualms in saying that this one of the finest Les Pauls we've played. Through our stock Marshall JTM45, it does all that you'd expect: driving bridge pickup tones, warm and woody neck, twangier in-between settings and, of course, a plethora of other sounds available from tweaking volume and tone controls. A particular favourite is both pickups on: bridge pickup, full volume and tone; neck pickup, volume on seven but tone back to four. This produces a sort of 'woman tone lite' that's vocal and expressive, and usable in any number of situations. Flip to either pickup on its own, knock back the volume, and the tone becomes bright and articulate. It's great for chords, general rhythm or arpeggios. Whack everything up full and there's power aplenty at your fingertips, yet never once did we feel the horse was in control of the rider. The elephant in the room is, of course, the non-use of period-correct timbers. With the quantities that Gibson will be making, even of these 'limited production' instruments, that's clearly impossible. 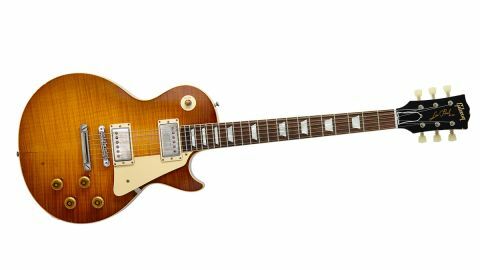 However, other companies are employing Honduran mahogany and Brazilian rosewood on extremely low-run, prestige models - with the requisite certification in place, of course - so we'd love to see Gibson offer this as an 'uber' limited edition, over and above the main range. We shudder to think what they'd cost, but we're pretty sure every last one would find a home. And on that thorny question as it relates to our guitar, we would suggest that price is all but irrelevant since the True Historics are so desirable that well-heeled Les Paul lovers will barely bat an eyelid. We've played this guitar through Marshall's new Astoria amp, a Fender Blues Junior, a Morgan SW22R, and demo'd it using our own JTM45. It's met or exceeded sonic expectations at every turn and proved a joy to play. Plus, it looks so good, it's hard to keep one's eyes off it. Hand on heart, we'd ultimately prefer the all-purpose '59 neck profile over our guitar's shallower 1960, but that's merely a matter of choice - others would sell their soul for it. And who would blame them? It's hard to recall an instrument that's caused such a stir here- and it's not as though we don't see our fair shareof desirable electrics!